The US may not dominate for much longer, however. Although China trails the US by $7 trillion, it’s catching up. China’s economy grew by 6.7% in 2016, compared with America’s 1.6%, according to the IMF. 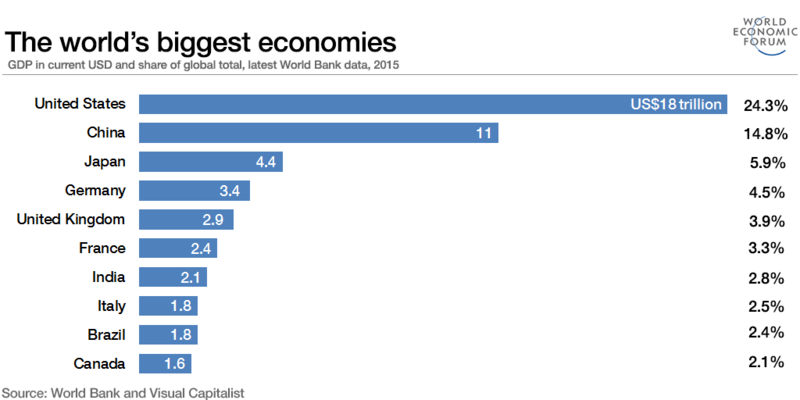 China has also overtaken India as the fastest-growing large economy. The IMF’s World Economic Outlook estimated China’s economy grew at 6.7% in 2016, compared with India’s 6.6%. Brazil’s economy has contracted in the last year by 3.5%, the only one in the top 10 to do so. 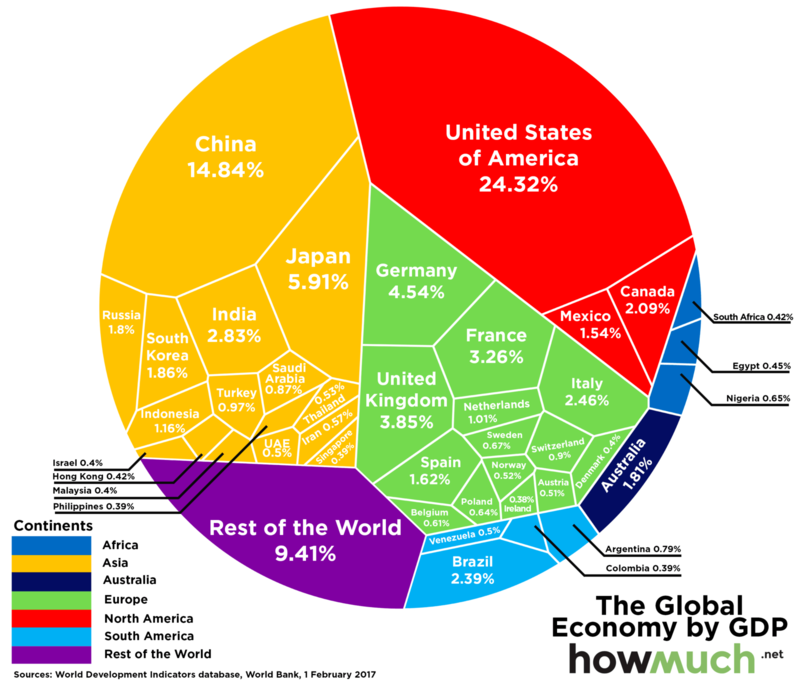 The chart above shows the world’s 40 biggest economies individually, but grouped by colour into continents. The Asian bloc clearly has a larger share than anywhere else, representing just over a third (33.84%) of global GDP. That’s compared to North America, which represents just over a quarter, at 27.95%. Europe comes third with just over one-fifth of global GDP (21.37%). Together, these three blocs generate more than four-fifths (83.16%) of the world’s total output. A new study by PricewaterhouseCooper says that China will be in first place by 2050, because emerging economies will continue to grow faster than advanced ones. India will rank second, the US will be third, and fourth place is expected to go to Indonesia. The UK could be down to 10th place by 2050, while France could be out of the top 10 and Italy out of the top 20 as they are overtaken by faster-growing emerging economies such as Mexico, Turkey and Vietnam. The report also says that the world economy could more than double in size by 2050, far outstripping population growth, due to technology-driven productivity. China, the US, and trade: What next?